Foaming can be a troublesome by-product of an aerobic bioreactor treating wine cellar effluent. The foaming is caused by the composition of wine and cleaning chemicals used in the cellar. PROTEIN FOAMING Next time you drink wine, red or white, with a straw experiment abit by blowing into the wine. A wonderful froth bubbles almost immediately. This nameless property of wine is partly due to the presence of proteins. Proteins have been used for many years as whipping agents in meringues, marshmallows, and nougats. Egg white (albumen) was the original ingredient used in these products, and it is still used in large quantities by the food industry. Other whipping proteins include casein and soy-based proteins. 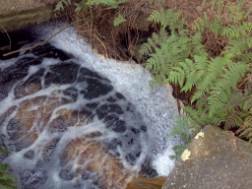 Natural foaming in mountain waters. In the picture to the right, some expansive foaming is clearly visible above this open roofed bioreactor. The foaming offers a quick indication of excessive and wasteful chemical usage. HWT wine cellar bioreactors usually have a covering roof to contain the foam. 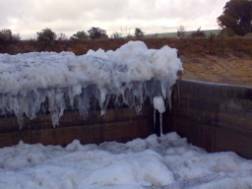 Not only is foam a nuisance, but it also lifts biomass and quite quickly all the biomass can be lying around the bioreactor rather than inside. The attendant mess and drastic dip in effluent quality are compelling reasons to keep a wine effluent bioreactor well covered.